This mosaic of images shows the soil in front of NASA's Mars Exploration Rover Spirit after a series of short backward drives during attempts to extricate the rover from a sand trap in January and early February 2010. It is presented in false color to make some differences between materials easier to see. Bright-toned soil was freshly exposed by the rover's left-front wheel during the drives and can be seen with a "sand wave" shaping that resulted from the unseen wheel's action. Spirit's panoramic camera (Pancam) took the component images during the period from the 2,163rd to 2,177th Martian days, or sols, of Spirit's mission on Mars (Feb. 2 to Feb. 16, 2010). The turret at the end of the rover's arm appears in two places because of movement during that period. Insets in the upper left and lower right corners of the frame show magnified views of the nearby inscribed rectangles within the mosaic. The patch of ground within each rectangle is about 25 centimeters (10 inches) across. 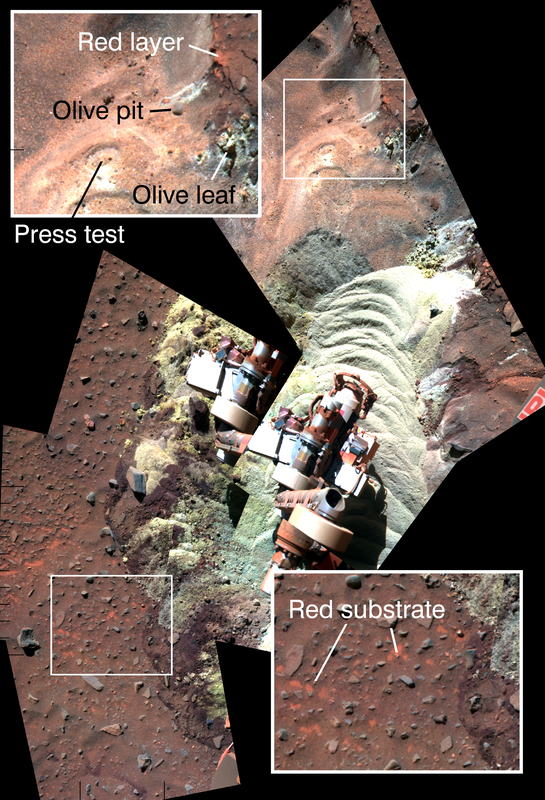 The top inset and upper portion of the mosaic include targets within soil layers exposed by the action of Spirit's wheels in April 2009 and examined in detail with instruments on Spirit's arm during the five subsequent months. "Olive pit" and "Olive leaf" are two of the analyzed targets. The investigations determined that, under a thin covering of windblown sand and dust, relatively insoluble minerals are concentrated near the surface and more-soluble ferric sulfates have higher concentrations below that layer. This pattern suggests water has moved downward through the soil, dissolving and carrying the ferric sulfates. The brightness and color of the freshly disturbed soil seen in the center area of the mosaic indicates the this formerly hidden material is sulfate-rich. Before Spirit drove into this patch, the surface looked like the undisturbed ground highlighted in the lower-right inset. Flecks of red material in the surface layer resemble the appearance of the surface layer at other locations where Spirit's wheels have exposed high-sulfate, bright soils.